In Texas shortly after the Civil War, things are getting a little out of control. The Native-Americans are trying to reclaim their lost tribal lands, the Mexicans keep coming across the border in search of more area, and crooks and thieves are making things rough for anyone who is trying to make an honest living. 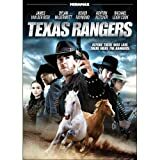 A group of men form the Texas Rangers, a group who will fight for the lives of Texans, even when they may be outnumbered and outgunned.